Bass is critical in all kinds of music. From the accurate representation of French horns, double bass and tympani in classical music, to TR-808 kick drum samples in hip-hop, big bottom is not just Spinal Tap's ultimate manufestation of the feminine mystique. 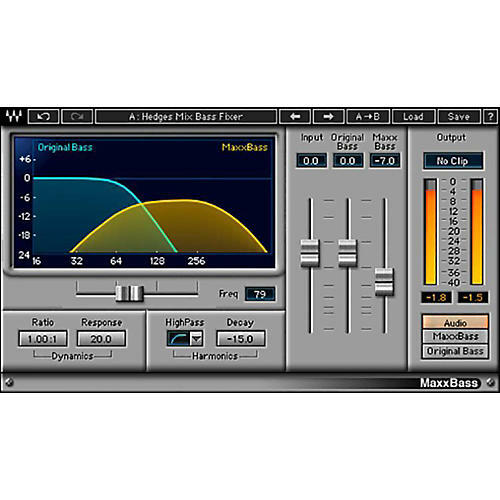 When you need to seriously pump up your lows, MaxxBass is one of the best solutions in the plug-in market. Waves' meticulously researched and developed bass enhancement technology has been used on more hit records and major motion pictures than any other. MaxxBass uses psycho-acoustics to calculate precise harmonics that are related to the fundamental tones of sound. When these harmonics are combined, it creates the effect of lower, deeper frequencies. For TDM only.